We had some A-related news this past week that I was taking some time to process. I was in a therapy session feeling all mentally frozen, and my therapist suggested we haul out the sand tray and toys. Why not. I ended up having the most fun with a Minion figurine. To me, Minions represent the dubious-yet-endearing ways in which people often perceive the autism community. I am not an expert on all the movies, so please excuse me for not providing specifics. I recall one of them beginning with a sort of historical overview of Minions through ancient times till the present, and it struck me how much they were being made to symbolize autism. They have always searched for a way to belong in a world that doesn’t know how to harness their boundless energy, their finicky attention to detail, and their infinite capacity to adore their hapless allies. Their partial verbal skills, need I say more? (Though in one of the movies, one of them was speaking Malay briefly, and I so wanted to write to the producers and give them hell for basically implying that other languages can be exploited to convey a sense of gibberish.) And their existence in a sort of underground, parallel world where they are usually safest—this is so close to how the severely autistic often have to survive in a world that doesn’t know how to accommodate them. And of course, how adorable Minions are despite their endless bopping and twitching. This is totally how we feel about A—he exhausts us, but then he is so ridiculous and loud and darling. In the center of my sand tray tableau was the Minion. The most disturbing part of the movies is how, as a hive minded community, they want people they can serve, before whom they can grovel. I think this is where the link with autism is actually at its most disturbing and powerful. The mirror is actually being held up to the abled community—that in the end, we expect the disabled to center us, not themselves. 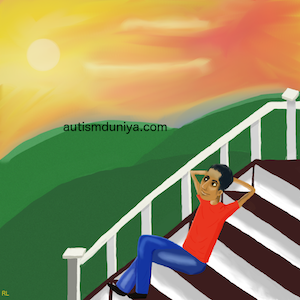 We may not consciously realize we are doing it, but we expect autistic people to inspire us. We expect them to cultivate vocations that serve society as it is, not as it could be. Productive cogs in a wheel that turns for the abled. Twitching, sensory challenged beings whose potential for mayhem must be kept contained so that we can continue as we ever were, with the autism community relegated to phantasms of our peripheral vision. And this, in the end, is how we are culpable in shaping autism brains. Get them young enough, and we can teach them that their identities rest in how they are reflected in our eyes. Not in how they would wish to exist if they didn’t have to live or die at the whims and imaginative limits of ableism. As parents, we cannot help but wrestle with our consciences on this issue, even if we do not do it through the lens of Minion philosophy. We want our beloved child to claim his own space in the world. He is both intellectually free and frighteningly dependent. Some answers will unfold in their own time. In the meantime, I live out my most loving wishes and my darkest fears for him in my head and heart. I would not wish to be different in my mothering; it is the only way I can search my intentions and the external world for truths that are not conjured solely by neurotypical constraints.